We are close to the new parliamentary elections in Israel. It was very surprising to see this new party’s “fantastic” propaganda clip, which presents a new type of connection between politics and capitalism. [https://twitter.com/Ayelet__Shaked/status/1107718043571048450]. At a conference in Milan in 1972,Lacan spoked about a “fifth discourse” based on that of the master, in fact substituting for the master discourse. This change is produced by a small inversion between the element situated in the master discourse in the position of agent and the other element situated at the place of the truth. In other words, an inversion between the master signifier and the divided subject. Lacan said about this discourse that it is “follement astucieux” [‘madly’ or ‘devilishly’ astute]. He says : « Ça marche comme sur des roulettes, ça ne peut pas marcher mieux, mais justement ça marche trop vite, ça se consomme, ça se consomme si bien que ça se consume. » [“It runs like clockwork, it couldn’t go better, but it just goes too fast, it is consumed, it is consumed so well that it consumes itself”]. The propaganda clip that takes the form of an ad responds to this description, it offers something to consume – the perfume, the fragrance. 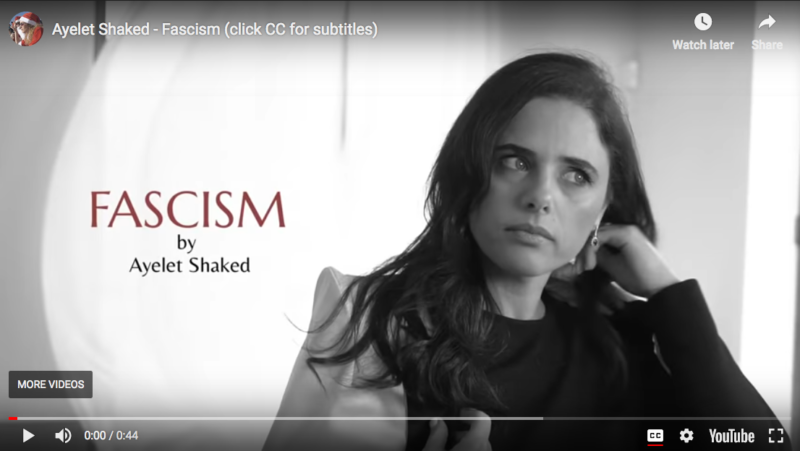 Ayelet Shaked appears as a model or an actress advertising a new perfume called “Fascism”. Interesting and alarming. The little video, only 44 seconds long, shot in black and white to reinforce the visual impact, presents the characteristics of this perfume. While Shaked is grooming herself and moving through an esthetic space, a woman-narrator’s whispering voice in the background recites one by one the phrases: “judicial revolution”, “reduction of activism”, “appointment of judges”, governance, “separating of authorities”, and “restraint of the Supreme Court of Justice”. Finally, as Shaked spritzes herself with the perfume, she says in her irritating and uncolored voice, “To me, it smells like democracy”. Fascism as Democracy, which leads to an inversion – what the so called “left-wing” regards as signs of fascism, is presented here as real democracy. This ad imposes subliminally a master discourse which tries to hypnotize by the esthetic image and cover the atrocity under the pretense of freedom of speech. Politics here uses ideas from capitalistic discourse, especially in order to encourage consumption, thereby reinforcing the addictive power at the place of a symbolic identification with an Ideal. Lacan teaches us about the ascension of the little object a to the social zenith. Indeed, it is the object which determines the subject and his will: the magnificent perfume “Fascism” as the supreme social value. This clip introduces a powerful way of resisting the other, creating a new product in the market of ideas, a fragrance, smelling only of segregation. It is a condensate of explosive Hate, which can lead to the worst.